The appartment is located in a relatively quiet environment. The bus station is 3 min. by foot and the bus line leads directly to the city center (10 min. by bus) and to the train station (15 min. by bus). The proprietor kindly arranged a shuttle service from/to the train station. The neigbourhood is relatively calm and safe. However, you can hear the traffic from the roads nearby that lead to the city center (rue Saint Jean) and to Juan-les-pins (blvd Delmas), especially if you like to sleep with open windows. Also, noises from arriving/departing airplanes to/from Nice airport can be heard until late night-time depending on the weather conditions. As the apppartment´s direction is mainly to the South and there´s no air conditioning it can get very hot inside if you don´t close the shutters during daytime. As there is no awning (only a small sun umbrella) on the balcony there is few shade. There are two small shops, a bakery and a pharmacy easy to reach by foot (10 min.) or by bus (2 min.) at the bus stop "Roy de soleil" - prices are higher there than in the city center. Although the sofa is described to be relatively new (2009) and declared to be not the one shown on the photos it is unfortunately not very comfortable - neither are the chairs on the balcony. Also, both the refrigerator and the dishwasher are very loud and there is unfortunately no door to the kitchen that could be closed. All things considered, I would still recommend the appartment, especially to holidaymakers that seek an easily accessible accomodation and have no car with them. Cet appartement est vraiment très agréable nous ne voulions plus partir ! Il est moderne et entièrement équipé, de plus le ménage effectué avant notre arrivée était impeccable et l'accueil fut très agréable. La résidence est jolie et calme. Il se situe au 1er étage mais il y a 3 marches à monter à tout casser. La ville d'Antibes est vraiment très sympa et son vieux centre est très mignon. Il faut toutefois s'y rendre en voiture de l'appartement. Le propriétaire est disponible pour répondre à vos questions et les personnes de l'agence sont très gentilles. Très satisfait. Appartement agréable, bien situé dans un endroit calme et reposant. Bonne prestation et un bon accueil pour la remise et le rendu des clés.A pied, des commerces à moins de 10 min et la mer accessible en 25 min. A recommander. Merci beaucoup. Au plaisir de vous recevoir de nouveau ! De l'accueil au départ tout s'est trés bien passé. Appartement extremement propre et fonctionnel. Quartier super sympa et calme. With less than 10 minutes of the exit of highway of Antibes.De plus a bus stop is with 20 meters of the residence. 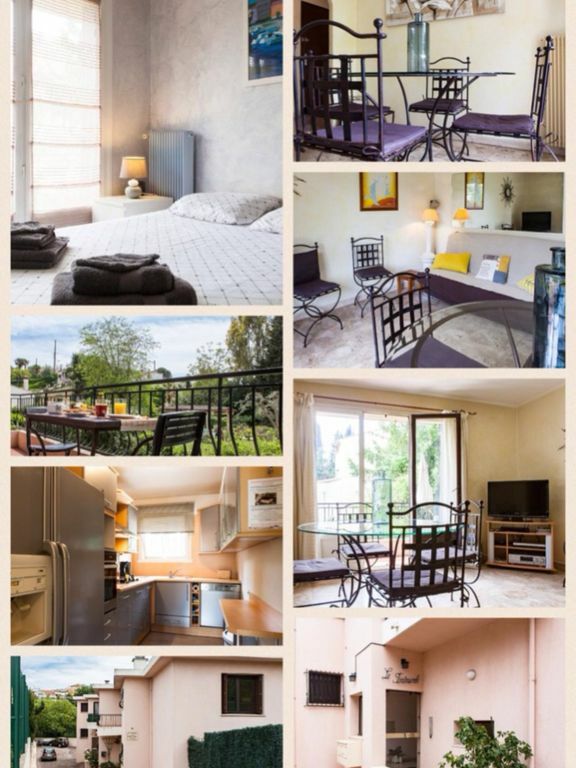 To return to you to the apartment it is enough for you to leave to the exit “Antibes”. Then you pass one 1st large round not, a second with the quick on your line and Mac Do on your left. You continue straight to the 3rd round not and there you will see a kind of mini fast track in which you will engage. It succeeds (at the end of one kilometer on a round not). There you will take on the left a small way which goes up and while rolling 1 minute you arrive at the residence opposite the Italian restaurant. You are there! tarif dégressif en fonction de la durée, caution demandée, acompte/arrhes à la réservation. Certaines promotions de dernière minute ne sont pas toujours actualisées.